The new US away kits officially dropped on Monday. It was impossible to miss, with images of the new blue-streaked shirts littered across social media by everyone from Nike, US Soccer, current mens and womens players to blogs, news agencies and randoms alike. But if you weren’t paying that close of attention, you could be forgiven for thinking that someone had instead dropped an atom bomb on the USSF headquarters in Chicago, such was the negative reaction to yet another American soccer decision. Whether or not it was a majority is up for debate, but it’s clear a sizable portion of the American fan base hated the jersey. Their ire seems to be pointed in multiple directions too, with Nike, US Soccer and even Sunil Gulati receiving poignant 140-character tirades since its official release. It was described as “ugly”, “effortless” and “unneeded”. Some were angry that it replaced the beloved “bomb pop” kit dawned by the US men in Brazil last summer — which, if you recall, also received a fair bit of scorn when it was first released. Whether or not you like it, I don’t really care. I’m a fan. But then again, it’s my opinion and we’re all entitled to our own. It’s all subjective anyway and it’s no skin off my back if you don’t like it. But the outrage that followed the new kit release wasn’t an isolated incident. 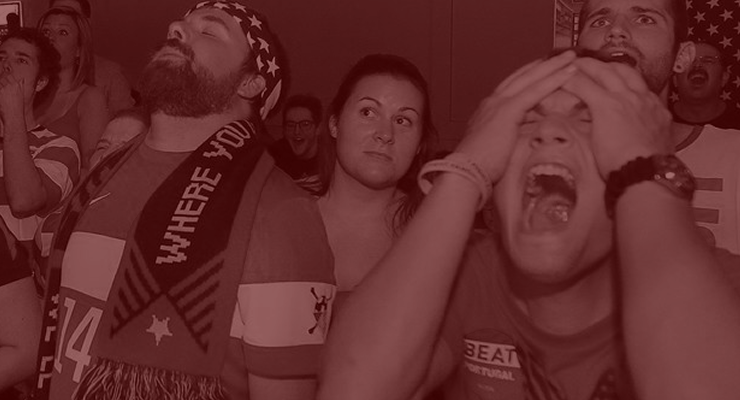 In fact, those who follow the American soccer scene will note that we’ve had outbursts of anger so regular of late that it’s starting to feel like planned strategy. We have an incident that sparks fury, the storyline is strung out for a week or two, and then a new one pops up and we repeat the cycle. Clockwork, almost. Before a piece of clothing worked everyone into a tizzy, the media and supporters alike were feuding over Jurgen Klinsmann’s comments about how US players weren’t dedicated or fit enough. How dare he accuse US players of being lazy? What, Matt Besler said he didn’t expect to be fit for the January camp? Ignore that, because Klinsmann is the devil! Rabble, rabble, rabble! Prior to that, everyone was outraged over how bad the national team have looked since the World Cup. Never mind the fact that it’s the February after a World Cup, a time when results matter the least and discovering what fresh faces there are in your talent pool matters the most. Who cares about that anyway? They’ve only won one in six! Rabble, rabble, rabble!! Leading up to that, everyone was pissed off with Major League Soccer for their numerous drafts, their confusing player distribution methods, Frank Lampard, the league’s lack of transparency, the rapidly approaching labor dispute, Don Garber’s suit selections, and ten million other things. Rabble, rabble, rabble!!! And even before that, everyone was worked up over the whole Don Garber vs Jurgen Klinsmann debate over whether MLS was a suitable location for US players to be plying their trade. Or how about the never ending Promotion and Relegation debate? Or how Klinsmann is only bringing in Germans these days? Or that USL PRO are making a run at Division 2 sanctioning? Seriously, is there anything that anyone likes about American soccer any more these days? It sure seems like there isn’t, and it’s driving me insane. While I hate to pull the “things were better back in the day” card, I can’t help but miss the days when there were only a handful of us that gave a damn about soccer in this country. Sure, we had things to complain about too: the lack of coverage, the dearth of acceptance by our peers, the lack of progress our (men’s) national team had made — okay, maybe that last one is still doing the rounds. But the news we did get was often good: breakthroughs for the sport, a player rising from obscurity to give us hope, getting dedicated coverage from something like the now extinct FOX Soccer Channel. It was nowhere near this constant stream of negativity that we now suffer through today. I’m not saying there’s no room for criticism in today’s American soccer landscape. That’s hardly the case at all. Instead, I long for perspective to be considered once again. I would really like for patience to be granted, too. And I’d really love it if everyone to remember that opinions are like asses; everyone has one. Everything isn’t so black and white. There’s grey area where multiple opinions can be both right and wrong. So why then are we seeing all of this negative reaction all the time? Back in the day, the few of us who closely followed the game were often people who grew up playing, watching and studying the nuances of the game. We all had witnessed the rising and falling of the tides, and could see the game’s cyclical nature. We knew that progress takes time, and that setbacks are frequently encountered on the road to the promised land. Today, while those of us who have been around for ages are still here, our voices are at times drowned out by a recently-joined, exponentially larger group that haven’t been with the game as long. They haven’t seen the setbacks. Many don’t remember Steve Sampson and his disastrous 4-6-0 at France ’98 after a surprising run at USA ’94. They didn’t have to worry about MLS collapsing in the late 90’s. Many can’t even imagine a time prior to Landon Donovan, let alone a time before MLS. Hell, a good number of the new converts have never even played the game themselves. And while it’s great to have all of these new faces watching with us — and they’re equally entitled to their anger and joy — it seems many tend to react without looking at the bigger picture. Too, social media and the modern world’s 30-second new cycle certainly don’t help anything either. There are some of us in the media that are guilty of using the momentary bursts of interest to fuel clicks and ad revenues. They help to draw lines in the sand, and then the radicals in the population dig their trenches on either side and lob rhetoric at one another. It’s exhausting at a minimum, and counterproductive at its worst. Now, by no means do I expect it to go away. This is the new norm, whether I like it or not. And there are definitely problems that need to be rectified in US soccer. But I would ask that, next time you’re ready to send a pipe bomb to MLS headquarters or hire an assassin to take out Klinsmann, you take a minute to pause and think for a second. Remember that things aren’t really that bad right now, that things have been far worse, and that we live in a time where soccer is actually relevant. Should everyone manage to pull that off, it could be at least slightly more like the good ‘ol days. If only for a minute or two. I totally know where you are coming from, but feel that it is more the result of anonymity and negativity that social media fosters. What has sustained my enjoyment of reading and to a much lesser degree, writing about US Soccer is that I have the ability to filter those voices who I find less than credible. I don’t always agree with you, but what fun would it be if I did. For me (and so many fellow supporters) it’s the friendly banter and who’s better Messi or Ronaldo conversations that keep me engaged with the beautiful game.